Over 15 years of experience in sales and marketing with a degree in Computer Information Systems from Baruch specializing in Systems Analysis. I worked at major companies such as AT&T, HP, and Societe Generale and have always made a commitment towards excellence and professionalism. 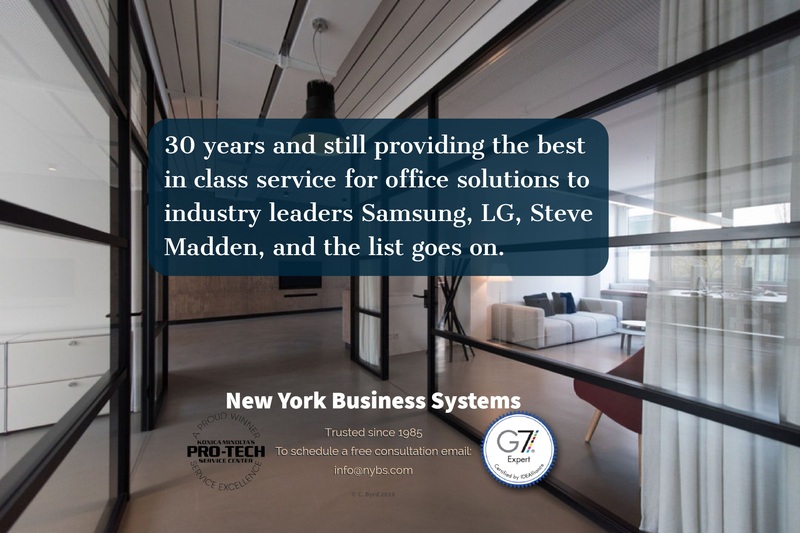 Now I manage and overs all of the marketing strategies and campaigns for NYBS with a goal of engaging customers in new ways and helping to build our brand and image in exciting new ways. It is "Back to School" time again, and purchasing/IT managers are once again faced with making sure their offices are well prepared for another demanding cycle. No matter how many years of experience you have, it is always a daunting task to go through the buying process. 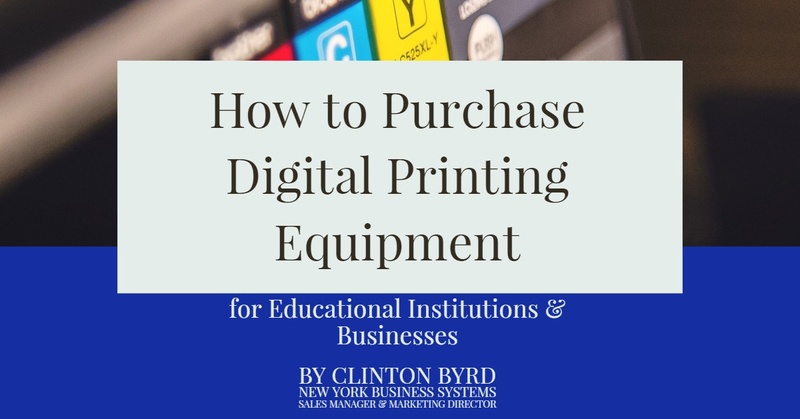 So I am here today to give some insights on the basic considerations you must prepare for with purchasing digital printing equipment to help you along! As usual, I aim to sum up the most important items, and make it relevant to you! We are pleased to announce the launch of the Konica Minolta Accurioprint 3070L. 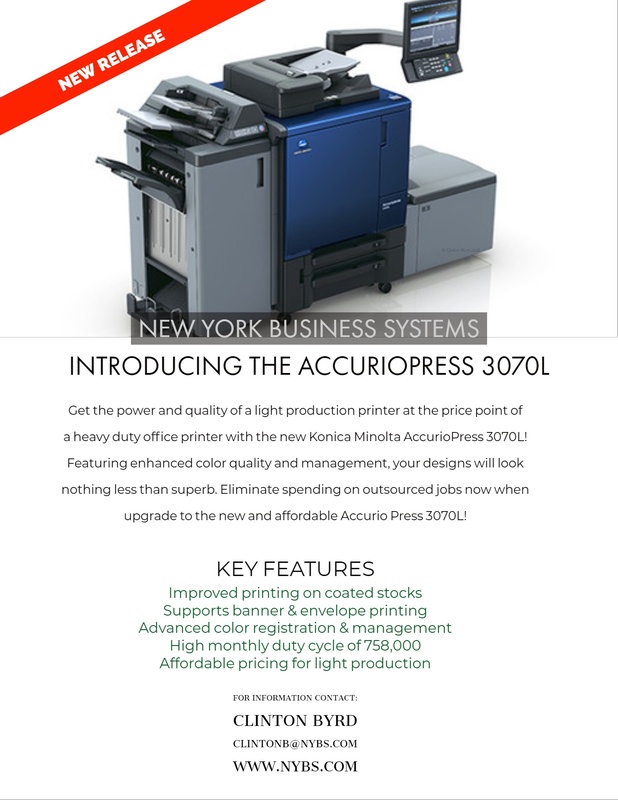 In brief, this is the affordable scaled down version of the Accuriopress series with the same digital printer engine to support high quality and high volume production. Here are the key takeaways in considering this model for your business. Konica Minolta has created a partnership with Hewlett Packard Enterprise (OEM) to build customize IT solutions that bridge with Konica Minolta's technology portfolio. Konica harps that the synergy between their teams is a perfect fit to help build a 3, 5, or even 10 year roadmap. Canon has recently announced their new TX series line of Imageprograf wide format printers and 3rd party collaboration with the Onyx 12.2 (by Onyx Graphics) workflow and RIP software solution. 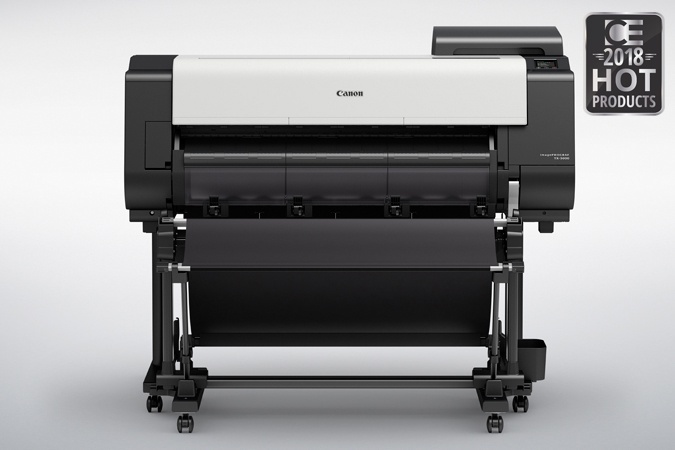 Along with Canon's new water resistant Lucia TD ink and Matte Polypropylene media which can together withstand up to 6 months in the outdoors without lamination, this new combination of features and enhanced software capabilities puts Canon in a strong leadership position in the large format printing market. We are happy to start the new year with our new blog. We plan to post informative technology updates, achievements and activities within our company, and promotions relevant for all verticals and industries. Our business is helping to improve your business with the latest innovations on the market! Our priority is to give our customers the technological edge they need to make informed decisions and to stay competitive and efficient in this market. The innovators are the leaders! What will you find on our blog?